Confession: I attempted to be on a reality show. Many many years ago. The first time MTV's Real World went to New Orleans actually. I'm old- ha. They did in fact pick a cast member from UGA (and GA Tech too)....just not me. Oh and Bestie totally helped me. She choreographed and filmed the video. Because that's what 20-something best friends do late at night instead of studying. I hope I never get famous for fear of that lame video of me blabbing about myself seeing the light of day. I have to say that's hilarious! Hindsight is 20/20, though. You're better off in your own reality (thought living the NO would have been fun! You shouldn't feel old. 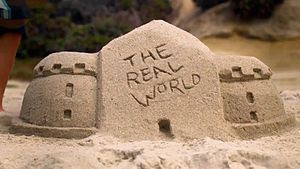 I was in college when the FIRST Real World hit MTV. Funniest part at the time, I lived in a house with 2 guys and 2 girls. We went out Halloween that year as "Real World ECU." I want to be on Survivor. I'd even go on and sign off on the 1 million. I'd go on it to lose the weight and for an adventure. That is wild! Be glad you were saved because they always manage to or try to humiliate you. HA too funny - I would LOVE to see that video! Can You Believe That Was 26 Years Ago? Why Is Everyone So Upset About Paula Deen? Tag, I'm It. Times Two!